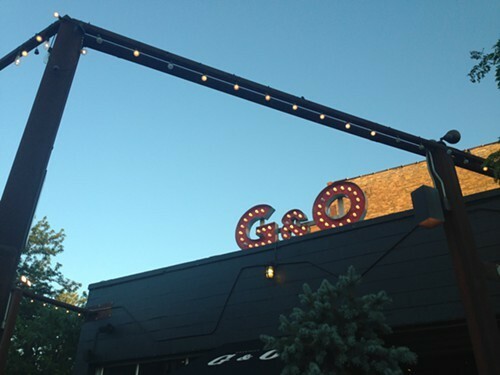 Named for its location—near the intersection of Grand and Ogden—the G&O Tavern sits just a couple blocks from its sister bar, the Aberdeen Tap. It's more upscale than the Aberdeen, which offers pretty straightforward bar fare like sandwiches, wings, tater tots, and a good selection of draft beer. Oddly, the only beer that's consistently on tap at G&O is Coors Banquet, though there are three other taps that have a rotating selection of craft beer, and quite a few bottles. The focus seems to be more on the dozen-odd cocktails and the complicated-sounding dishes (the lamb chops come with dill pesto, whipped chai parsnips, and "yogurt buttered green beans," whatever those are). None of the food we ordered was as exotic as it sounded, which you could either consider good (because what's wrong with simplicity?) or bad (because at these prices, don't you deserve a little extra flair?). The frites were supposedly served with smoked sea salt and cracked pink peppercorns, but they didn't taste particularly smoky or peppery. In fact, aside from the dipping sauces—a sweet house-made ketchup, an incendiary jalapeno jelly, and what I think was garlic mayo—they were some of the most straightforward fries I've ever had, just crispy enough to be unobjectionable. I wish I could say the same for the brussels sprouts. Served with oyster mushrooms, lemon, and a balsamic vinegar reduction, they were soggy and undersalted. Dunking them in the balsamic that pooled at the bottom of the bowl helped the flavor a little, but didn't solve the texture issue. Fortunately, we fared better with the silky scallops—though I wasn't impressed by the bland wontons stuffed with cranberry-butternut squash puree that accompanied them. Possibly the best of the bunch were the crispy, fresh rock shrimp fritters drizzled with remoulade and "Szechuan sauce." But what had become a theme of "good enough" continued with dessert, house-made chocolate truffles (one rolled in bacon bits, another in coconut) that were fairly pleasant, but a tad on the sweet side and very soft. My friend gave up after a couple bites, noting that it was like eating chocolate frosting.